knowing where the other hunters' dogs would run we set out to head them off leaving our bear as he was. We proceeded at full speed till we came to the place to which I knew they would run; but we arrived just after the bear had passed. We saw two of the dogs, and had we been a quarter of a minute sooner we would have had a shot at that fellow also. In a short time the other hunters came up and proved to be two of the Davises; the father being an older man than myself, and one who had killed many bears. He and his son accompanied us to where I had killed the bear, and helped us to pull him out of the hole. He told me he had not seen such a fat bear during the last ten years. We carried home the meat which weighed nearly three hundred pounds; and a piece of it which was cut in a square form after it was salted and raised out of the brine measured six inches of clear fat on every side with not a speck of lean in it. This bear and I had been in a fight before during the previous summer. I fixed up a canoe in the following manner for the purpose of shooting deer along Deep Creek (now Deep Creek Lake) by candlelight. I took a sheet of maple bark, doubled it into the form of a half square and secured it in place with a forked stick; after which I arranged a position for the candle in the flat side of the bark. The flat surface of the bark formed a shed-like covering over the back part of the canoe while the perpendicular side being placed toward the front entirely hid any object which might be behind it in the canoe. Two cross-lathes were nailed on the canoe, one across the top, and the other inside; and each of these was pierced with an augur hole to receive the upright pole that held up the bark-shed and the candle; which being a large wax one lighted up the creek to a considerable distance. The deer used to come into the Creek to drink, and to eat the moss which grows on the bottom. I would take the canoe up the Creek in the evening and be ready to drift down as soon as the deer entered the water; all the time sitting unobserved under the shade of the bark though I could in that position see to shoot by the light of the candle. 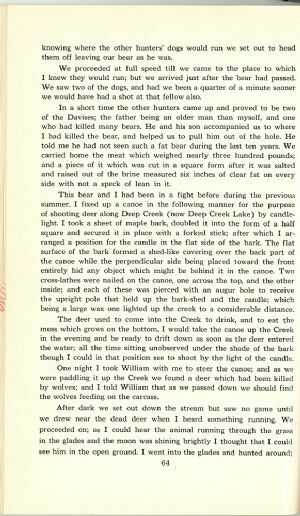 One night I took William with me to steer the canoe; and as we were paddling it up the Creek we found a deer which had been killed by wolves; and I told William that as we passed down we should find the wolves feeding on the carcass.